Many thanks to United Way of Moscow/Latah County for awarding $3000 to Palouse HFH to cover material and overhead costs for home repair projects for low-income homeowners in need of accessibility repairs in our area. What does that mean? Elderly and disabled individuals in our area can get in and out of their homes safely! If you or someone you know is a homeowner in Latah or Whitman County, has income at or below 60% Area Median Income, and has a home repair need, please contact the Palouse HFH office at habitat@palousehabitat.org or call 208-883-8502. 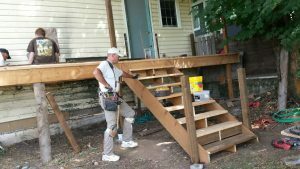 We are primarily able to to exterior repairs, focused on ramps, steps, porches and other accessibility work.